The James McCormick Mansion serves as a prime example of the Second Empire architectural style. This style was predominantly French and was prominent during the time of Napoleon in the mid 1800's. It consisted of many schools of thought and embraced the forms of many past periods of architecture including Greek, Roman, Baroque, Rococo and Gothic. Houses of this style often contained a square tower as seen on the McCormick Mansion. Built in 1869, this house served as the residence of James McCormick II, president of the Dauphin Deposit Bank from 1874 to 1908. The cost of the finished limestone structure was estimated to have been between $15,000 and $25,000 (approximately $416,400 - $694,000 in 2008 dollars). At the date of its completion, the McCormick Mansion was considered to be the most expensive home ever built in Harrisburg. When finished, the house consisted of 25 rooms and 13 bathrooms on four floors. There was a large porch covering the entire left side of the house and a balcony above that. There was also originally a roof over the front stoop with a small balcony above that. The property originally attached to the house covered an entire block from Locus Street to Walnut Street. Following the death of James McCormick in 1917, his five unmarried sons resided in the house. The last son to live there was Donald McCormick, who also served as president of Dauphin Deposit Bank. Upon Donald's death in 1945, the house was willed to the Harrisburg Public Library, which used it to house their administrative offices. In 1976, the library put the house up for sale due to the high cost of repairs that was needed to maintain and restore the house. Shortly after the library decided to sell the property, there was a small fire in the basement. Holes were cut into the first floor to allow the Harrisburg Fire Department to extinguish the fire. The house sustained heavy smoke and water damage in the basement and first floor. After repairs were made to the house, a Decorators Show was held in late 1976 by the Junior League as a fundraiser. Each room was decorated by a different leading interior decorator from the Harrisburg Area. The house was opened to the public for a short time for this event. John Roe, an attorney, purchased the McCormick Mansion in 1976. 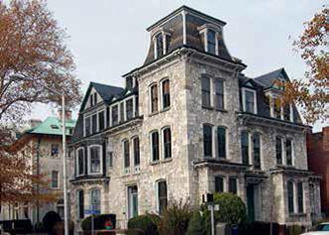 The house remained law offices until it was purchased by the Association of Independent Colleges and Universities of Pennsylvania (AICUP) in 1997. Please note that the McCormick Mansion is not wheel-chair accessible.